2008 March Archive « .Evolving Music.
. 0 Comments Tags: American Idol, Bacardi, Coca-Cola, Dr. Pepper, Groove Armada, Guns N' Roses, partnerships. In this day and age – with the unprecedented level of access to information that people have through the internet and other means – consumers are not nearly as gullible as they used to be. Consumers are not only bombarded with advertising from every angle and have to find a way to filter through it, but they have also become jaded to a degree with traditional sales and advertising methods. I know I have. One thing I’ve found interesting in this new climate is the tricky ways that some of the big players are partnering up to try to reach this new breed of audience. Big name sponsors like Coca-Cola teaming up with shows like American Idol come as no surprise, but then there are some unlikely marriages that make me think “um…weird” at first, but ultimately make a lot of sense. 1. Dr Pepper is shamelessly trying to tap into the music blogosphere with this campaign. 2. Anyone who posted about this offer is a fool and are playing right into Dr Pepper’s hands. Guess that makes me one too. Liquor companies have long been reaching their tentacles into the music industry, with tour sponsorships and what not. But what about a specific liquor brand partnering with a specific band? Like Bacardi and Groove Armada? The English electronic music duo, is (according to Wikipedia) “best known to the music listening public for producing music that have featured in numerous media including advertising campaigns, movies and computer games” so they are no stranger to collaboration. I’m curious to see if this begins to happen on a smaller scale as well, with unsigned independent artists. As the MySpace/YouTube generation of musicians find fame online, will they also find ways to partner with smaller brands?
. 1 Comment Tags: Ghosts, in rainbows, mixmatchmusic, NIN, Nine Inch Nails, radiohead, Thom Yorke, Trent Reznor. Over here at Evolving Music, we’ve covered both the Radiohead and the Nine Inch Nails album release concepts as they tie in directly with the questions and evolution of the music industry that concern MixMatchMusic. While I’ve stated in previous posts that I think Trent Reznor’s tactics on his release were a bit more open source-esque than Radiohead’s, I haven’t gone to great lengths to compare and contrast the two, as I like them both. Luckily for the rest of us who need to judge, categorize, compare and contrast anything these two do, Wired magazine has done just that. Place your votes people!
. 7 Comments Tags: Amie Street, BlastMyMusic, CD Baby, independent musicians, Mike Stocksdale, MixPal, NIN, radiohead, record labels, Stage.FM. CD Baby – I first heard of CD Baby years ago when my childhood friend and accomplished musician, Mike Stocksdale, let his friends know that his album was available for purchase through them. The “little online record store that sells albums by independent musicians” has been around for a decade and, according to New Music Ideas, has become “one of the biggest digital distributors on the planet.” As you can see on their about page, artists make $6-$12 per album and get paid weekly. Amie Street – If you weren’t already familiar with Amie Street, you may have seen them mentioned in conjunction with the Eliot Spitzer scandal. Ashley Alexandra Dupré not only posted a few of her songs on her MySpace, but also adroitly thought to post them on Amie Street where “all songs start free and rise in price the more they are purchased.” Predictably, a bunch of people – being the victims of morbid curiosity that we silly humans are – bought the songs, which subsequently rose to the $.98 max. The company gives 70% of song sales back to the artists. MixPal – Though I only recently discovered (and briefly blogged about) this service, it’s probably one of my favorites. The idea of being able to set your own price, keep most of the proceeds, be paid immediately though PayPal, and even place a MixLink on any other website makes their approach a very attractive one. BlastMyMusic – Another site that is all about fans supporting the artists directly, BlastMyMusic lets you buy singles OR albums on the artist’s profile on the site or through the “Music Blaster” on the artist’s website(s). Yes, the Music Blaster is also a facebook app – one where “fans can earn 5% for each song they sell and at the same time help gain further exposure for their favorite bands” to boot! Though artists only get 65% of the profit using BlastMyMusic, the widgetized aspect is pretty sweet. Stage.FM – Formerly known as Audiri and based on the old mp3.com model, Stage.FM allows you to search for music using a tag cloud and tends to emphasize free music. In a great concise review of the site, New Music Ideas notes that while still a bit buggy, the site is great because: “Stage.FM lets artists sell tracks through the site and keep 100% of the sale price. Artists can set the price for each track, from $0.20 to $1.60, or let visitors download it for free. Money from sales is transferred to the artist’s PayPal account every month. And the Stage.FM music player widget lets artists sell their tracks from their own domain and social networks too.” I also like the “find bands near you” feature. There are far too many services out there to make a comprehensive list, but if your favorite is not listed above, feel free to leave a comment and name your preferred service – with a link to your profile of course! Also, stay tuned for some revolutionary new ways to sell your music online (piecemeal, for example) through MixMatchMusic, coming soon to a computer near you. March Madness is for Everyone: Rockers, Obama, Nerds, and You!
. 0 Comments Tags: 94WYSP, bracket-generating algorithm, broadway, Hustle and Flow, Kansas, March Madness, music, nerds, Obama, Philadelphia, rock, Terrence Howard. For example, Philly’s Rock Station, 94WYSP, is hosting “Rock Madness”. There are 64 bands. You fill out your own bracket and should you pick correctly, you win a 42″ HDTV. Of course, the catch is you have to live in the greater Philadelphia area, as per the official rules. Or, let’s adress another demographic: the nerds. Though not typically huge sports fans, why not let the geeky types join in…but with their own unique approach. A somewhat more mathematical one, let’s say? Check out Owen’s Photolog, in which he predicts – by way of a “bracket-generating algorithm that uses the seeds to generate weights for a random function” – that Kansas will win. Finally, for the theater-lovers out there, March also means the beginning of Broadway season. Anybody else surprised to see Terrence Howard starring on Broadway? Makes sense though, I guess. The guy blew me away with his acting and singing in Hustle and Flow. I’m sure he’ll kill it. So whatever your passion this month – be it basketball, music, or otherwise – join the madness. In whichever way you see fit.
. 0 Comments Tags: AMC, Breaking Bad, Cee Lo, Danger Mouse, Gnarls Barkley, Gnarls Biggie, hip-hop, mash-ups, music, Notorious B.I.G., rap, St. Elsewhere, The Odd Couple. In 2006, St. Elsewhere, an album of collaboration between producer Danger Mouse (The Grey Album, Ghetto Pop Life) and rapper Cee-Lo Green (…is the Soul Machine) dropped and instantaneously brought a variety of new mixmatched sounds to the hip-hop industry. The album covered Funk, Soul, R&B, Hip-Hop, Lounge and Electro in equal parts, never hesitating to throw them together and see what came out. This excellent album was an instant hit and spawned the ridiculously popular “Crazy” which began popping up anywhere you could find music. Following the success of the album, the DJ Sound Advice put his own re-mix spin on the tracks by releasing, for free download, Gnarls Biggie, an album comprised of mash-ups between Gnarls Barkley tracks and Notorious B.I.G. vocal tracks. Yesterday, weeks ahead of the scheduled April release date, St. 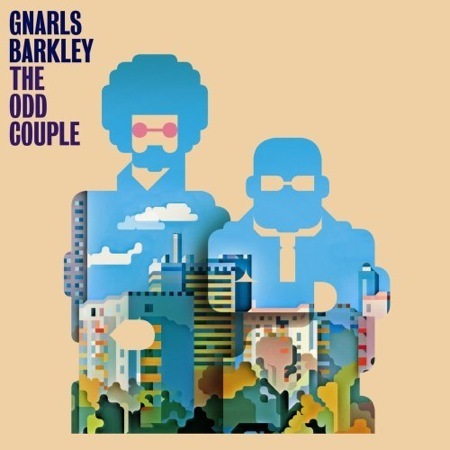 Elsewhere officially became the freshman offering from Gnarls Barkley as they released their sophomore album, The Odd Couple. “Going On” refreshes the upbeat and clap-happy sounds of the first album, bringing about the feeling that a few more “Crazy”-like songs aren’t too far away. Cee-Lo works over organ samples and a beating drum tempo before Danger Mouse turns the last minute into a atmospheric piece of a more sinister nature complete with fuzzed out electronic influence. Track 4 brings out “Run (I’m a Natural Disaster)”, the first single from the album. The single makes it clear that Gnarls is going to try to capitalize on the retro-as-new feeling that made “Crazy” and “Smiley Faces” so popular. The song kicks off with a moving shout and response chorus of sampled children’s voices that breaks up into Cee-Lo’s manically paced lyrics. Once again, Danger’s production skills take over the last minute of the song as he starts mixing more of Cee-Lo’s singing over the party sound he’s created with the clapping and instrumentation. The raw emotional happiness of “Run” gives way quickly to a much more somber and dark “Would Be Killer.” Here, Cee-Lo moves slowly over a beat laced with background ambient sounds and record slips which help the entire song feel a bit like vinyl being played backwards on an old 45. He fluctuates into higher ranges in certain parts, yet never feels out of place, which continues to be one of the most surprising and reliable portions of his music…even when he takes his vocals to an extreme, it never feels lost or out of place. “Open Book” kicks off with a frenetic and off-syncopated beat complete with bird sounds and strings in the background. The chorus for this song devolves considerably with Cee-Lo’s screaming tone pushed to the background of the music as a more wall of sound approach engulfs the track. Here though, it feels less like the two are having a good time with the music as it does on other tracks, and a bit more forced, as if they’re getting intentionally darker just to see what it feels like. For this reason, it’s a relief when the more playful Barkley re-emerges on “Whatever,” a track that reminds me of the “Liar Liar” remix in the card scene from Lock, Stock and Two Smoking Barrels. The slower beat provides a nice contrast to some of the previous songs, and the use of Cee-Lo as the chorus vocals show that sometimes things can be intentionally ugly and still work musically within a broader tapestry. “Surprise” finds Cee-Lo lamenting his lack of a soul mate. An acoustic guitar added on this track softens the sound a bit from the all electronic cuts on the album, but it’s a bit disheartening to hear Danger once again fall back onto the hand claps. The hand clap sound is certainly big right now in popular music, but Danger is capable of more, and when he uses it on the majority of tracks on the album, it becomes hard to ignore as a staple of his beats. This constant hand clapping, while used in very different songs for different purposes, still comes off feeling forced at the end, and a bit disappointing that Danger doesn’t mess around with background sounds that could be used to replace the hand clap on certain songs. But the bigger surprise about “Surprise” is when it’s followed by an electronically backed love ballad of sorts in “No Time Soon.” The music for this song sounds like Danger took some influence from Nine Inch Nails as the heavy machinery feel provides the backdrop for a more melodic approach over the top. “She Knows” finds the duo slowing down a bit with a lo-fi sound that could be the Price is Right theme song on quaaludes. The 70s airy melodies and simple, slower beat take the pace of the album down a notch while providing it with an even more pronounced retro sounds. “Blind Mary” demonstrates the diversity of this tandem. While the majority of the album skips over various genres, the end results are still directly tied to Gnarls Barkley with the style of retro bordering on hip-hop. On “Blind Mary,” the exploration of tampering with genres starts with an almost carnival-like sound before slipping into an easy going, foot tapping Indie Rock exploration. The end result is a lighthearted jaunt where Cee-Lo’s distinct voice and Danger’s cohesive production (featuring, again, unfortunately, more hand clapping) produce a unique sound that could be featured on a variety of radio stations. “Neighbors” again keeps the tempo slow and features Cee-Lo’s lyrics with a good deal of distortion on the chorus. The easy hip-hop beat, combined with layers of electronic melody and bass funk create an interesting sound, and Danger keeps it together with a variety of vocal samples interlaced. The album comes to a close with “A Little Better,” a song that starts slowly using vinyl pops with a simple bass line and Cee-Lo talking about past moments in his life and his shortcomings. The drop step of the drums on the chorus, combined with a stair-step bass part and Cee-Lo singing in a soulful and at times gospel-like voice create a very easy song to listen to, fading out towards the end with a series of thank yous. For any fan of St. Elsewhere, I can’t imagine a better follow up attempt by Gnarls Barkley. While it lacks a song that feels to me as unavoidably popular as “Crazy” was, it has some definite hits on it, and you can never tell what kind of radio and club airplay any of these songs will get if they get a remix makeover from some other DJ. Above all though, the album does a fantastic job at never becoming stagnant. Aside from the hand claps, Danger never relies too heavily on any one genre or production style, and Cee-Lo never lets his rap background influence him to a degree that would detract from the rest of his work. Furthermore, with not a single track clocking in over the 4 minute mark, the songs leave you wanting a bit more as opposed to having you looking for the skip track button. For the latest in the MixMatch style and the artful collaboration of artists and genres, look no further than The Odd Couple.